At Incremental, we are experts at extracting business value from data and helping you to make sense of the large quantity of data in your business. We help organisations to embrace descriptive, predictive and prescriptive analytics. In order to do more with data your organisation needs strong data foundations, based on accurate and accessible data. With out-of-the-box AI, ML and Cognitive services, Azure can bring data science into your business and applications. We live in an increasingly digital world. As individuals, almost every aspect of our daily life has been affected, with digital technology helping us communicate, travel and relax. This digitalisation of daily life has led to an explosion in the creation of data. Data describing our shopping habits, travel patterns, and even social interactions is increasing exponentially as digital technology continues to get more and more sophisticated. Digitalisation offers organisations a huge opportunity to optimise their effectiveness. From simple changes, such as adopting new communication channels to allow customers to connect directly with your organisation via social media, to much more advanced predictive analytics, such as embedding cameras within building sites to automatically set off alarms if a person walks into a restricted area without a hardhat. Data analytics offers huge scope for efficiency improvements. For many organisations, embracing this change can seem daunting, due to the complexity of putting it into practice. For initial ventures into data analytics, Incremental recommends a step-by-step approach, breaking work into smaller, more manageable projects, each of which adds value to the organisation and enables the next. Incremental has the data science expertise and technical knowhow to help your organisation start this journey. Descriptive analytics focusses on taking the raw data from your organisation and extracting the most useful information from it. The purpose of descriptive analytics is to summarise the data in a way that humans can understand and easily digest. Descriptive analytics helps you understand and analyse certain changes such as how an organisation’s policy change has affected customer satisfaction, or how a change of supplier has impacted financial performance. Adding descriptive analytics puts in place the fundamental building blocks required to scale your organisation. Power BI is a cloud-based business analytics tool that enables organisations to connect to, visualise and analyse data with improved performance, efficiency and understanding. Power BI connects users with a broad range of live data through easy-to-use dashboards, interactive reports and compelling visualisations that bring your data to life. The next step after descriptive analytics is to take the historical data gathered and use it to make predictions about the future. The purpose of predictive analytics is not to tell you what will happen but to tell you what might happen, with some degree of certainty. Imagine predicting the anticipated demands for certain products over the course of a buying period. Predictive analytics cannot tell you exactly what will happen, but the use of modelling, using sophisticated algorithms, enables more accurate, data-driven decisions to be made. 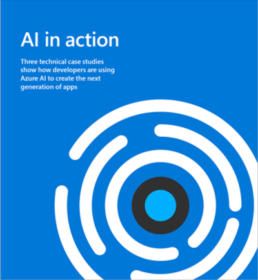 Get an in-depth look at how developers like you are using artificial intelligence (AI) to create the next generation of apps. Why is Docker so great for data scientists?